Here is an interesting group of HO-scale freight cars that were sold by Mantua in the mid-'60s. The ad below was found on the inside front cover of the January 1964 issue of Model Railroader magazine. 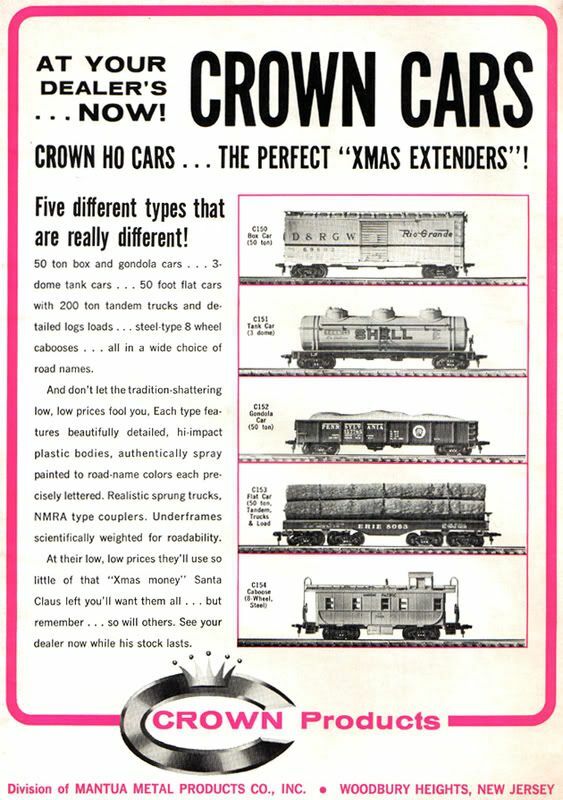 The Crown Products were a division of Mantua, according to this ad. It is rather interesting and a bit curious that a new nameplate was given to this line. TYCO had been Mantua's name for ready-to-run trains, since the early 1950s, but it is not used for these freight cars. If you look closely, you'll notice these cars appear to be similar to ones found in the AHM line and also Bachmann's line. When these cars surfaced in the Bachmann line, as of 1970, they carried Bachmann Hong Kong origin markings.